Every OS has its distinct features like the Aero Effects in Windows Vista, Super Bar in Windows 7, Mac OS has the dock, Linux Open Source etc., some features like the Icon Dock in Mac OS are very user friendly and there are quite a few free software that mimic the same functions for other OS. Quicklook – preview files by pressing spacebar. Mac Hotkeys – Use all the same hotkeys as Mac OS with just the simple change of using Windows Key instead of Command Key. Spaces – Intuitive virtual desktops with easy switching. 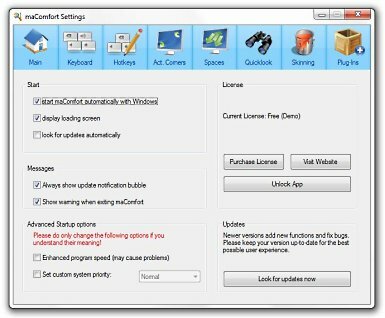 Active Corners – Program the screen corners to toggle a specific action. Sound Control – keyboard shortcuts for sound control. The user interface can also be customized using the Themes. maComfort is compatible with Windows OS.